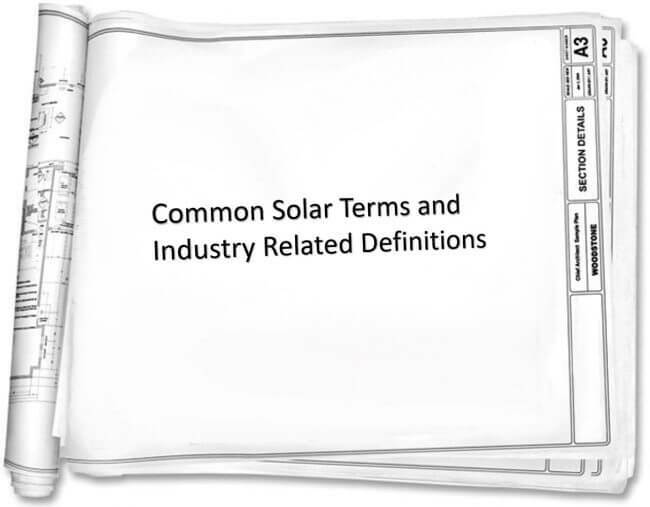 This solar glossary contains definitions and technical terms related to solar power and photovoltaic (PV) technologies and the systems that support their use. This is a short list of terms, and there are many many more that exist. Absorption Coefficient – The ratio at which photons are absorbed over the unit of distance as they travel through material with photovoltaic properties (e.g., silicon). Alternating Current – AC – Electric current in which the direction of electron flow is reversed at intervals (frequency). AC electricity is used in most household appliances and the electricity grid. AM – Airmass – a unit of atmospheric mass measurement commonly used in the discussion of rating solar photovoltaic panels. The AM measurement for photovoltaic solar panels at standard test conditions (STC) is 1.5AM. Amorphous silicon – Amorphous semiconductor – Thin-film, the non-crystalline semiconductor material that can be used in the production of solar electricity via the photovoltaic effect. Ampere – A – A measure of electric current (compare: power (W) and volt (V)). Ampere-hour – Ah – A unit of electrical charge stored in a battery. 1Ah equals the flow of 1A of current for one hour. Antireflection Coating – A thin coating over a photovoltaic cell that improves light transmission onto the cell, and reduces the amount of reflection of light off the cell. Array – A number of solar photovoltaic (PV) panels connected together, usually all feeding into one solar inverter. Azimuth – Horizontal angle measured clockwise from true north with 180 degrees being true south. Balance of System (BoS) – all the components of a solar photovoltaic system except for the photovoltaic solar panels themselves. Base load – When talking about power stations, the minimum amount of electricity that a power generator must supply at any given time. Battery capacity – The maximum total electrical charge, expressed in ampere-hours, which a battery can deliver to a load under a specific set of conditions. Battery – A device that stores electricity in chemical bonds for later discharge and use; in terms of solar power, batteries are ordinarily only used in stand-alone or off-grid solar power systems. Building-Integrated Photovoltaics (BIPV) – Design of solar photovoltaic systems into the building envelope, taking into account whole-of-system energy efficiency and strategic passive solar and HVAC design considerations. BIPV units may replace ordinary building components, including windows, awnings, roofs, and walls. Capacity – The measure of a solar power system’s output, usually in peak conditions. Capacity is usually measured in Watts (W) or kilowatts (kW). 1kW = 1000W. Amps x Volts = Watts. Current – The measure of the ‘flow rate’ or ‘intensity’ of electricity, measured in Amps (A). Amps x Volts = Watts. Direct Current (DC) – The type of electricity produced by solar panels and which comes out of batteries. The electricity grid and most household appliances use Alternating Current (AC). Energy – As differentiated from ‘power,’ energy is the ‘amount’ that you have stored to do work for you. Batteries for solar power systems store energy, not power. Externality – The costs or benefits that are not financially accounted for in the pricing of a resource. An example of a positive externality would be the scenic value a tree planted by your neighbor that gives you shade in summer. An example of a negative externality is carbon emissions given off by the burning of fossil fuels–unless accounted for under a carbon tax or emissions trading scheme. Feed-in Tariff– FiT – A rate paid to those who own or operate power generation systems (such as solar or wind) that feed electricity back into the electrical grid, usually to encourage the uptake of renewable energy. Feed-in Tariffs are paid for by the government, or conventional electricity retailers are required to pay a set rate to those feed electricity into the grid and are signed up for such a scheme. Fill factor –The ratio of a photovoltaic cell’s actual power to its power if both current and voltage were at their maximum. A key characteristic in evaluating cell performance. Frequency – The number of repetitions per unit time of a complete waveform, expressed in Hertz (Hz). Gigawatt (GW) – 100 megawatts (MW) of capacity. Germany currently has approximately 60GW of solar photovoltaics installed. Ground-mounted solar – A solar system that is installed on land; used primarily for large-scale commercial and utility-scale solar projects such as power plants that generate power for thousands of homes and businesses. High-efficiency – An adjective used to describe the conversion of energy or power available to usable energy or power. The most efficient solar panels in the world reach just about 20% efficiency (i.e., sunlight to power). For a solar inverter, efficiency refers to the rate at which DC electricity from your panels is converted to grid-compliant AC electricity. Heat coefficient – When solar panels get hot, they lose efficiency. A heat coefficient is a rate at which solar panel power output is reduced, and is usually measured in terms of -% per degree above 45C. Inverter – An inverter transforms DC electricity (produced by solar panels and batteries, among other things) into AC electricity, which is what the electricity grid and most household appliances use. Irradiance – The direct, diffuse, and reflected solar radiation that strikes a surface. Usually expressed in kilowatts per square meter. Irradiance multiplied by time equals insolation. Joule (J) – A measure of energy. However, in electronics, the convention is to measure energy in watt-hours (Wh) or kilowatt-hours (kWh). Junction box – A photovoltaic (PV) solar panel junction box is an enclosure on the PV module where PV strings are electrically connected and where protection devices can be located, if necessary for example diodes. Kilowatt (kW) – 1000 watts or a standard unit of electrical power equal to the energy consumption at a rate of 1000 joules per second. Kilowatt-hour (kWh) – 1000 watt-hours, i.e., 1kWh is how much energy you would have produced if you ran a 1000W solar system in full sunlight for 1 hour. Large-Scale Generation Certificate (LGC) – A certificate created under the Enhanced Renewable Energy Target and issued to individuals or organizations that develop large-scale renewable energy projects, including solar PV and concentrating solar power plants. The price of an LGC (formerly known as a REC, or Renewable Energy Certificate) fluctuates with supply and demand. Lead-acid battery – A general category that includes batteries with plates made of pure lead, lead-antimony, or lead-calcium immersed in an acid electrolyte. Light-induced degradation (LID) – The tendencies of certain types of photovoltaic cell to lose efficiency over time due to constant insolation. Many solar panel manufacturers use anti-LID technology. Load – The demand on an energy producing system; the energy consumption or requirement of a piece or group of equipment. Typically this is expressed in terms of amperes or watts in reference to electricity. Megawatt (MW) – 1000 kilowatts (kW) of power. Maximum power point tracker (MPPT) – A power conditioning circuit and or unit that automatically operates the photovoltaic generator at its maximum power point under all conditions. Operating range, inverter – The voltage or power range within which a solar inverter functions. Peak efficiency – The highest output efficiency level that a solar panel or a solar inverter can reach. Photovoltaics (PV) – Technology (usually semi-conductor-based) that converts light, especially sunlight, into usable electricity. Plug-and-play PV system – A commercial, off-the-shelf photovoltaic system that is fully inclusive with little need for individual customization. The system can be installed without special training and using few tools. The homeowner plugs the system into a PV-ready circuit, and an automatic PV discovery process initiates communication between the system and the utility. The system and grid are automatically configured for optimal operation. Power density – The ratio of the power available from a battery to its mass (W/kg) or volume (W/l). Power factor (PF) – The ratio of actual power being used in a circuit, expressed in watts or kilowatts, to the power that is apparently being drawn from a power source, expressed in volt-amperes or kilovolt-amperes. Rectifier – A device that converts alternating current to direct current. Renewable Energy Certificate (REC) – A certificate created under the Enhanced Renewable Energy Target and issued to people who install renewable energy generators, including solar PV systems. The price of a REC (now officially known as an STC, or Small-scale Technology Certificate) fluctuates with supply and demand. Resistance (R) – The property of a conductor, which opposes the flow of an electric current resulting in the generation of heat in the conducting material. The measure of the resistance of a given conductor is the electromotive force needed for a unit current flow. The unit of resistance is ohms. Small-Scale Technology Certificate (STC) – A certificate created under the Enhanced Renewable Energy Target and issued to people who install renewable energy generators, including solar PV systems. The price of an STC (formerly known as a REC) fluctuates with supply and demand. Smart grid – An intelligent electric power system that regulates the two-way flow of electricity and information between power plants and consumers to control grid activity. Solar Power – Power generated by the sun, either through photovoltaic technology or concentrating solar power (CSP) or solar thermal. Solar Installer – A company or person who installs solar power systems. Solar photovoltaic effect – The phenomenon through which sunlight is converted to electricity via materials with photovoltaic properties. Solar Panel – A module composed of solar photovoltaic materials that turn sunlight into electricity. Stand-alone system – An autonomous or hybrid photovoltaic system not connected to a grid. May or may not have storage, but most stand-alone systems require batteries or some other form of storage. Standard test conditions (STC) – Conditions under which a module is typically tested in a laboratory. String – A number of photovoltaic modules or panels interconnected electrically in series to produce the operating voltage required by the load. Sulfation – A condition that afflicts unused and discharged batteries; large crystals of lead sulfate grow on the plate, instead of the usual tiny crystals, making the battery extremely difficult to recharge. System availability – The percentage of time (usually expressed in hours per year) when a photovoltaic system will be able to fully meet the load demand. Thin-film – PV solar technology constructed with very thin layers of PV material to create a lightweight, often flexible sheets of solar energy-producing modules. Thin-film solar is generally cheaper and more versatile than conventional solar panels, but it is also less efficient and degrades more quickly over time. Tilt angle – The angle at which a photovoltaic array is set to face the sun relative to a horizontal position. The tilt angle can be set or adjusted to maximize seasonal or annual energy collection. Tracker – Mounting systems used in solar power plant installations enabling solar panels to move and follow the sun throughout the day, increasing solar electricity production. There are different kinds of trackers in the market, including single axis trackers and duel axis trackers each with different designs. Transformer – An electromagnetic device that changes the voltage of alternating current electricity. Volt (V) – A unit of electrical force equal to that amount of electromotive force that will cause a steady current of one ampere to flow through a resistance of one ohm. Voltage – The amount of electromotive force, measured in volts, that exists between two points. Voltage at maximum power (Vmp) – The voltage at which maximum power is available from a photovoltaic module. Watt – The rate of energy transfer equivalent to one ampere under an electrical pressure of one volt. One watt equals 1/746 horsepower or one joule per second. It is the product of voltage and current (amperage). Zero net energy — Zero net energy (ZNE) defines homes and buildings that generate as much energy as they consume, usually via a combination of green building techniques that include a solar energy system.